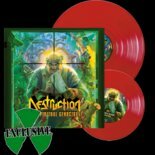 DESTRUCTION - SPIRITUAL GENOCIDE VINYL LTD. EDIT. (2LP) | Online Shop | Wizard LTD. Album: "SPIRITUAL GENOCIDE VINYL LTD. EDIT. (2LP)"
Legendary German thrashers DESTRUCTION have just released their 30-years-anniversary album “Spiritual Genocide” on November 23th. When Rock Hard Germany calls the anniversary album »Spiritual Genocide« “the most diversified DESTRUCTION record of the post-re-union phase“, it doesn’t only reflect the overall press reception perfectly, which ecstatically sways between joy at the presented trademark aggression and surprise in view of the atmospherically grooving parts, but also takes the exact line that Schmier and his band mates had in mind. Be assured: When DESTRUCTION sound the charge once again before the end of the year, no thrash metal disciple will be able to escape from the fanned inferno. No matter how fast you’ll run – the Mad Butcher will eventually get you all!